Find out how a CoachingOurselves program is designed, delivered and priced. Download success stories, articles and videos. See our customer testimonials. 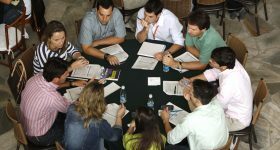 Group Coaching as a Leadership Development Program. CoachingOurselves' Co-Founder and President published a very inspiring article in Choice Magazine that highlights the relevance of peer coaching groups to develop leadership capacity and support organizational change in an industry facing major transformation. Use CoachingOurselves with your clients or find CoachingOurselves certified coaches, consultants, and training providers. Find a public workshop or webinar on CoachingOurselves or find us at one of these conferences and tradeshows. In this video Phil LeNir, introduces the background, theory and impact of the CoachingOurselves peer-coaching program. Learn more about our mission and how we change the world through moral and ethical management. Peer-Coaching Groups For Your Team Offsite? Of course!